Full text of God’s Pottery Q&A with Wilson Hall ’95 and Krister Johnson ’95. 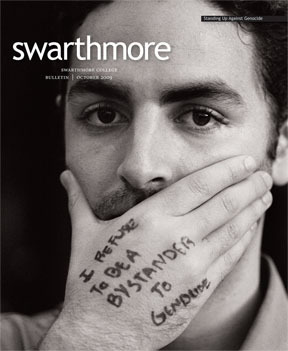 Jeremiah Smallchild and Gideon Lamb, also known as the Christian acoustic duo God’s Pottery, are eager to offer Swarthmore’s students advice about living a clean, chaste life. Q: Why is it important to maintain your virginity as a college student? Jeremiah: It’s actually not important to maintain your virginity as a college student. It’s just important to maintain your virginity until you’re married! Gideon: So if you want to get married before you go to college, then that’s fine. Just be warned that you may have some difficulty setting aside proper time for your midterms once you start having babies. Q: Even if they maintain their virginity, college students are going to want to date. Can you suggest some activities that can help them avoid being overcome by their desires while on a date? Jeremiah: Meet each other’s pastors… The possibilities are nearly endless! Gideon: Though they generally end at around eleven. Q: What should you do if on your way to brunch you see someone who is clearly taking a “walk of shame”? Jeremiah: This works extra well if the person is a complete stranger. Q: What action can you take if your roommate is engaging in some kind of sexual activity while you are in the room, supposedly asleep? Jeremiah: Well, you need to put a stop to the behavior quickly, but you don’t want to embarrass your roommate. If you sense that sins of the flesh are occurring, trying fake-yawning and saying loudly: “Oh my, I was just having that crazy dream again where my roommate Lance is fornicating with his hand. What a crazy dream! Why would I have that dream? It’s so crazy!” This should do the trick. Gideon: Yeah, but if more than one person is involved in the sinning, you may want to consider banging loudly on a pot or pan. Q: Is it OK to hook up with someone if one or both of you have been drinking? Why/why not? Jeremiah: Goodness no! It’s wrong to “hook up” with someone, and it’s wrong to drink! Gideon: This is one of the few times that a double negative does not equal a positive. Jeremiah: Drinking is a really dangerous situation regardless of what behavior you’re engaging in. Gideon: Many of the Youth don’t know this, but alcohol is actually a drug (in liquid form). So teens, ask yourselves: Would I hook up with someone if I were high on drugs?? Jeremiah: The answer, obviously, is no, unless you want to get pregnant and go to jail. And maybe die. Gideon: And then go to Hell. Q: As college students, did either of you ever almost give in to temptation when faced with a co-ed? Jeremiah: Almost? We did give in to temptation. Gideon: Yeah, for me it was Martha Bloomington, and for Jeremiah it was Sara Lee Froomkin. Jeremiah: We tried to resist our urges. We prayed together for God to release us from the grip of temptation. But it was no use. We had to do it. Gideon: And so…one night…we invited Martha and Sara Lee to our weekly Hungry Hungry Hippos tournament! Jeremiah: We’d always played “boys only,” but these girls were just too good to keep off the board. Gideon: Later than night, Martha and Sara Lee said that if we dared them, they would kiss each other. That’s when we called the police. For more of Jeremiah and Gideon’s spiritual guidance, check out their new book, What Would God’s Pottery Do? The Ultimate Guide to Surviving Your Teens and/or Being Successful! Press coverage on Auto-Tune the News and links to Gregory Brothers’ videos.